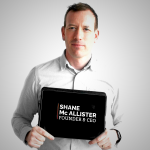 Shane Mc Allister founded MobaNode in October 2007 and is an award winning mobile design company specialising in engaging directly with consumers by developing and delivering personal, targeted, relevant applications and content to mobile devices. MobaNode was short listed for the TechCrunch Europa Awards, was a Munster Regional Finalist in the Intertrade Ireland Seedcorn awards and won the €60,000 Impact Media Elevate Award along with numerous “Appy’s” and “Sockies” awards for their app down through the years. MobaNode’s founder Shane Mc Allister was nominated as a “Net Visionary” by the Irish Internet Association.